Population Ranked 40th in the U.S.
Ranked 13th in the U.S.
Hawaii is the 50th state of the United States, achieving statehood in 1959. It is the only island U.S. state, and sits in a strategic position in the Pacific Ocean roughly midway between the continental U.S. and East Asia. Because of its proximity to Asia, Hawaii permits the U.S. to project influence in the Asia-Pacific region, including military, underscored by the presence of the U.S. Pacific Command based on the island of Oahu. By virtue of its multi-ethnic population, Hawaii contains a preponderance of Asian and Polynesian cultural influence, which facilitates interactions between Asian nations and the U.S., enhanced by today's availability of rapid transportation and instant communications. In effect, Hawaii stands unique among the 50 states with roots both in Asia and the Pacific, as well as North American culture. 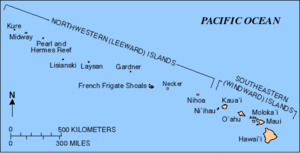 The Hawaiian Islands, once known as the Sandwich Islands, form an archipelago of 19 islands and atolls, numerous smaller islets, and undersea seamounts trending northwest by southeast in the North Pacific Ocean between latitudes 19°N and 29°N. The archipelago takes its name from the largest island in the group and extends some 1,500 miles (2,400 kilometers) from the island of Hawaii in the south to northernmost Kure Atoll. Of these, eight high islands are considered the "main islands" and are located at the southeastern end of the archipelago. These islands are, from the northwest, Niihau, Kauai, Oahu, Molokai, Lānai, Kahoolawe, Maui, and the Island of Hawaii. 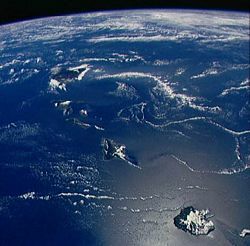 All of the Hawaiian Islands were formed by volcanoes arising from the sea floor through a vent described as a hotspot. The last volcanic eruption outside the Island of Hawaii happened at Haleakalā on Maui in the late eighteenth century. The newest volcano is Lōihi, deep below the waters off the southern coast of the Island of Hawaii. The isolation of the Hawaiian islands in the middle of the Pacific Ocean, and the wide range of environments to be found on high elevation islands, have resulted in a vast array of flora (plants) and fauna (animals). Native life before human activity is said to have arrived by the wind, waves, and wings. The volcanic activity and subsequent erosion created impressive geological features. Hawaii is notable for rainfall. Mount Waialeale, on the island of Kauai, has the second highest average annual rainfall on earth—about 460 inches (11,684 mm). The Island of Hawaii is notable as having the world's fifth highest elevation among islands. The climate is more subtropical because of the moderating effect of the surrounding ocean. Summer high temperatures seldom reach above the upper 80s (°F) and winter temperatures (at low elevation) seldom dip below the mid-60s. Snow falls on Mauna Kea and Mauna Loa on the big island in some winter months. Snow rarely falls on Maui's Haleakalā. Local climates vary on each island. Windward sides face the northeast trades and receive much more rainfall; leeward sides are drier, with less rain and less cloud cover. Tourist resorts are concentrated on the sunny leeward coasts. The largest city, Honolulu, located along the southeastern coast of the island of Oahu, was chosen by King Kamehameha III as the capital because of its natural harbor. Honolulu is also the largest city in Hawaii. Other populous cities include Hilo, Kaneohe, Kailua, Pearl City, Kahului, Kailua-Kona, Kihei, and Lihue. The islands were first settled by Polynesians, either during the second half of the first millennium C.E. or by voyagers from the Marquesas sometime before 500 C.E., and then by immigrants from Tahiti around 1300 C.E. Juan Gaetano, a Spanish navigator, may have visited in 1555. On January 18, 1778, Captain James Cook arrived and was surprised to find high islands so far north. He named them the "Sandwich Islands," after the First Lord of the Admiralty, the 4th Earl of Sandwich, John Montagu. Hawaii was united under a single ruler, Kamehameha I, in 1810. The chiefs considered themselves under British protection and flew the Union Jack until 1816. The monarchy then adopted a flag similar to the state's present flag, with the Union Jack in the top quarter next to the flagpole and eight horizontal stripes (alternating white, red, and blue from the top), representing the eight islands of Hawaii. In 1819, Kamehameha II ascended to the throne. He abolished the "kapu system" that had ruled life in the island. In 1820, a New England Congregationalist missionary group arrived. After a year of limited permission to proselytize, some of the highest-ranking chiefs converted. The commoners swiftly converted. The Christian chiefs attempted to rule the islands as a Christian nation, which led to conflict with resident Westerners and visiting ships, which preferred the old regime of abundant alcohol and promiscuity. When non-Hawaiian residents pushed for the right to hold land in fee simple, the ruling chiefs were persuaded to allow the land to be surveyed and divided between the king, the chiefs, and the commoners. Westerners could purchase land or register land claims. The "great mahele" (land division) was signed into law on March 7, 1848. On March 18, 1874, Hawaii signed a treaty granting Americans exclusive trading rights. The 1876 Reciprocity Treaty between the Kingdom of Hawaii and the United States allowed for duty-free importation of Hawaiian-grown sugar into the United States. This act promoted sugar plantation agriculture. Up to the 1890s, the Kingdom of Hawaii was independent and had been recognized by the United States, Great Britain, France, and Germany. However, there were threats to the kingdom's sovereignty. Lord George Paulet of the Royal Navy warship HMS Carysfort captured the Honolulu fort on February 10, 1843. Paulet demanded that King Kamehameha III abdicate and cede the Hawaiian Islands to Britain. Kamehameha stepped down, but protested to the British government and Paulet's superior, Admiral Richard Thomas. Thomas repudiated Paulet's actions, and on July 31, 1843, restored the Hawaiian government. In 1887, a group of American-born cabinet officials and an armed militia forced King David Kalakaua to promulgate the "Bayonet Constitution," which stripped the monarchy of much of its authority. Asians lost voting rights, as did 75 percent of the native Hawaiian population. Only well-to-do Europeans, Americans, and Hawaiians were given full voting rights. When Kalakaua died in 1891, his sister Liliuokalani, who assumed the throne, restored the monarchy's authority and stripped American and European residents of their suffrage. This prompted a group of European and American Hawaiian citizens to attempt to prevent the queen from abrogating the constitution. On January 16, 1893, John L. Stevens, Minister to the Kingdom of Hawaii (through the United States Department of State), worried about threats to Americans, landed a company of U.S. Marines and two companies of U.S. sailors in Hawaii. A provisional government was set up and Queen Liliuokalani gave up her throne. President Grover Cleveland's investigation concluded that United States representatives had abused their authority. Minister Stevens was recalled, and the military commander of forces in Hawaii was forced to resign. However, the Morgan Report, submitted on February 26, 1894, exonerated Stevens and the U.S. troops. Cleveland resumed normal diplomatic relations with the Hawaiian provisional government. The Republic of Hawaii was established July 4, 1894, under the presidency of Sanford Dole. The United States wanted the islands to establish a naval base that could protect overseas commerce. President William McKinley authorized the official annexation of Hawaii on July 7, 1898. In November 1899, Lance Paul Larsen took the issue of annexation to the newly opened Court of International Arbitration in The Hague, arguing that the United States had violated its 1849 Treaty of Friendship, Commerce, and Navigation. President Theodore Roosevelt, who championed the Court and won the Nobel Prize for using the Court to settle another dispute, refused to have the Hawaii complaint arbitrated. The islands became Hawaii Territory, a United States territory, on February 22, 1900. The territorial legislature convened for the first time on February 20, 1901. An attack on Pearl Harbor on December 7, 1941 by Japan, intended to decimate the U.S. Pacific Fleet and insure unimpeded Japanese access to oil, was the trigger for the United States' entry into World War II. On March 18, 1959, President Dwight D. Eisenhower signed a bill granting Hawaii statehood. Hawaii formally became the 50th state of the Union on August 21, 1959. President Bill Clinton signed the "Apology Resolution," on November 23, 1993, which apologized for alleged American participation in what it asserted had been an illegal overthrow in 1893. The state government of Hawaii is modeled after the U.S. federal government with adaptations originating from the kingdom era of Hawaiian history. As codified in the Constitution of Hawaii, there are three branches of government: executive, legislative, and judicial. The executive branch is led by the Governor of Hawaii and assisted by the lieutenant governor, both elected on the same ticket. The governor is the only public official elected in a statewide race; all other administrators and judges are appointed by the governor. The lieutenant governor is concurrently the Secretary of State of Hawaii. The governor and lieutenant governor oversee the 20 agencies and departments of the executive. The legislative branch consists of the Hawaii State Legislature, the 25 members of the Hawaii State Senate, led by the President of the Senate, and the 51 members of the Hawaii State House of Representatives, led by the Speaker of the House. The judicial branch is led by the highest state court, the Hawaii State Supreme Court. Lower courts are organized as the Hawaii State Judiciary. The state is represented in the United States Congress by a delegation of four members, two senators and two representatives. The history of Hawaii can be traced through a succession of dominating industries: sandalwood, whaling, sugarcane, pineapple, the military, tourism, and education. Since statehood was achieved in 1959, tourism has been the largest industry, contributing 24.3 percent of the gross state product in 1997. New efforts are underway to diversify the economy. Industrial exports from Hawaii include food processing and apparel. These industries play a small role in the Hawaii economy, however, due to the considerable shipping distance to markets on the West Coast of the United States and ports of Japan. The main agricultural exports are nursery stock and flowers, coffee, macadamia nuts, pineapple, livestock, and sugarcane. 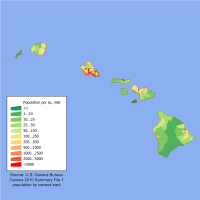 Hawaii is known for its relatively high per capita state tax burden. This rate can be explained partly by the fact that services such as education, health care, and other social services are all rendered at the state level, as opposed to the municipal level as in all other states. Millions of tourists contribute to the economy both by their infusion of cash and by paying general excise and hotel room taxes. The military presence and tourism attracts people to relocate there. The island of Oahu, which is aptly nicknamed "The Gathering Place," has a resident population of just fewer than one million. Ethnically, Hawaii is the only U.S. state that has a majority group that is non-white. The Chinese were the second group of immigrants to arrive after the Europeans, beginning in 1789. They arrived as workers on Western trading ships. Many Hawaiians of Asian ancestry are descendants of the early immigrants who came in the 1850s to work on the sugar plantations. Christianity is the most widespread religion in Hawaii. It is mainly represented by various Protestants, Catholics and Mormons. Buddhism is the second most popular religion, especially among the archipelago's Japanese community. Unaffiliated account for one-quarter of the population. The state of Hawaii has two official languages: Hawaiian and English. The state constitution requires the use of Hawaiian in official state business. Standard Hawaiian English, a subset of American English, is also commonly used for other formal business. Hawaiian is legally acceptable in all legal documents, from depositions to legislative bills. As of 2000, 73.4 percent of Hawaii residents aged five and older spoke only English at home and 7.9 percent spoke Pacific Island languages. Tagalog is the third most spoken language at 5.4 percent, followed by Japanese at 5 percent, and Chinese at 2.6 percent. Hawaiian Pidgin is an unofficial language. Hawaiian is a member of the Polynesian language branch of the Austronesian family. It was brought to the islands by Polynesian seafarers. Before the arrival of Captain Cook, the Hawaiian language was purely a spoken language. The first written form was developed by American Protestant missionaries in the early nineteenth century, who assigned letters from the English alphabet that roughly corresponded to the Hawaiian sounds. Additional characters were added later to clarify pronunciation. Hawaiian distinguishes between long and short vowels. The long vowels are written with a macron called "kahakō." Also, the presence or absence of a glottal stop is distinctive. In writing, a glottal stop is indicated with the "okina." Omission of the "okina" and "kahakō" in printed texts can even obscure the meaning of a word. As a result of a constitutional provision, interest in the Hawaiian language was revived in the late twentieth century and public and independent schools began teaching it. Specially designated Hawaiian language immersion schools were established. The University of Hawaii System, which runs several state university campuses, developed the only Hawaiian language graduate studies program in the world. Municipal codes were altered to favor Hawaiian place and street names for new civic developments. Most Hawaiian citizens speak pidgin, known by linguists as Hawaiian Creole English. The pidgin form of English developed in the nineteenth century. By the early twentieth century, a Creole English developed. A Creole language is typically considered to be a language derived from Pidgin speakers passing their language to the next generation. "Aloha," meaning "hello" and "goodbye," and "mahalo," meaning "thank you," are Hawaiian words in common use. Some Hawaiian words that have found their way into the mainstream American lexicon include "hula," a dance involving gyration of hips, "lei," a necklace made of flowers strung together, and "tiki," an image of a deity carved from wood. 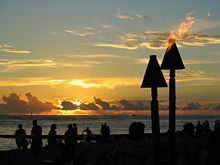 The aboriginal culture of Hawaii is Polynesian. Hawaii represents the northernmost extension of the vast Polynesian triangle of the south and central Pacific Ocean. While traditional Hawaiian culture remains only as vestiges influencing modern Hawaiian society, there are reenactments of ancient ceremonies and traditions throughout the islands. Some of these cultural influences are strong enough to have affected the culture of the United States at large, including the popularity (in greatly modified form) of "luaus" and "hula." Hawaii is the only state in the union with a unified school system statewide. The structure of the state Department of Education has been a subject of debate. The main rationale for the centralized model is equity in school funding and distribution of resources. Public schools in Hawaii have to deal with large populations of children of non-native English speaking immigrants and a culture that is different from mainland U.S. The public elementary, middle, and high school standardized test scores in Hawaii tend to be below the national average. Hawaii also has the distinction of educating more students in independent institutions of secondary education than any other state. It also has four of the largest independent schools: Mid-Pacific Institute, Iolani School, Kamehameha Schools, and Punahou School. The second Buddhist high school in the United States, and first Buddhist high school in Hawaii, Pacific Buddhist Academy, was founded in 2003. Graduates of secondary schools in Hawaii often either enter directly into the work force or attend colleges and universities. Most choose to attend one of many institutions of higher learning in Hawaii. Hawaii has a growing film industry. Several television shows, movies, and various other media projects were produced in the Hawaiian Islands. Notable films produced in or inspired by Hawaii include Blue Hawaii, the musical South Pacific, Raiders of the Lost Ark, Jurassic Park, Waterworld, George of the Jungle, and Pearl Harbor, among others. A somewhat divisive issue that has arisen since Hawaiian was adopted as an official state language is the exact spelling of the state's name. As prescribed in the Admission of Hawaii Act that granted Hawaiian statehood, the federal government recognizes "Hawaii" to be the official state name. However, many state and municipal entities and officials have recognized "Hawaii okina" to be the correct state name. ↑ Population and Housing Unit Estimates U.S. Census Bureau. Retrieved January 26, 2018. ↑ Median Annual Household Income - 2016 The Henry J. Kaiser Family Foundation. Retrieved January 26, 2018. ↑ 3.0 3.1 Elevations and Distances in the United States United States Geological Survey, 2001. Retrieved January 26, 2018. All links retrieved January 26, 2018. This page was last modified on 26 January 2018, at 21:07.